Technology, data and design are important, but nothing beats a common vision for getting people to join the war on waste, says Lendlease’s eco-concierge, Lucy Sharman. Australia woke up to a new headache on 1 January when China stopped taking our rubbish. More than 600,000 tonnes of scrap plastic and paper once bound for China each year must now be managed in our own backyard. Australians generate around 64 million tonnes of waste every year and that figure is growing. Just 58 per cent of our waste is recovered through recycling. While governments have set new national waste targets and promised to phase out single-use plastic, Australia’s property leaders have been waging war on waste for some time. Lendlease’s vision for Barangaroo South, one of Australia’s largest urban redevelopment projects, included ambitious sustainability targets including net zero waste to landfill. Sharman, an educator, communications and engagement specialist, is tasked with ensuring all commercial, residential and retail tenants at Barangaroo South share Lendlease’s sustainability vision. “We spent months setting up systems and processes so that everyone was heading down the same path from the moment they moved into the precinct,” Sharman says. Each of Barangaroo South’s 80-plus tenancies – food and fitness outlets, fashion boutiques and florists – boasts a Green Star rating. This means Barangaroo South has the highest concentration of Green Star tenancies in the country. One of the earliest challenges for Sharman was supporting the retailers’ switch to compostable packaging, and she spent months sourcing plant-based products. Every single retailer at Barangaroo South is required to use compostable packaging in their tenancy and plastic bags are prohibited. Many businesses have changed their procurement practices at other sites as a result of the lessons they’ve learnt at Barangaroo. “We have shifted the way people do business,” Sharman says. 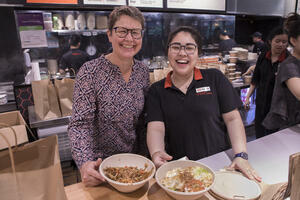 “Sustainability is not the core business of small retailers, but many jumped on board from the outset,” she says, pointing to Malaysian restaurant Ipoh Town which translated Lendlease’s education materials into the first languages of staff so that they could better understand and engage. Barangaroo South churns through around 10,000 disposable coffee cups a day, but Lendlease has banned single-use coffee cups from its offices and other tenants have followed suit, with some café owners providing discounts if you bring your own cup. Any single-use cups and lids that do slip through, along with soft plastics, such as wrappers and bags, are shredded and used as an alternative fuel in cement manufacturing. Barangaroo South manages 20 different waste streams – including e-waste, batteries, clothing and furniture – but food waste reduction is its main focus, Sharman explains. Each month, Barangaroo South’s macerator chews through up to 60 tonnes of food waste and compostable packaging, before it’s taken offsite and converted into green energy and fertiliser. “While this system is working well, we want to reduce the amount of food becoming waste in the first place,” Sharman says. Good data helps, Sharman explains, which is why the precinct weighs 600 to 900 bins every day and monitors bins for poorly sorted waste. This information allows Sharman and others to identify problems early and work with tenants to improve recycling rates. Sharman is now focused on Lendlease’s waste management strategy on its high-rise residential projects in the precinct. 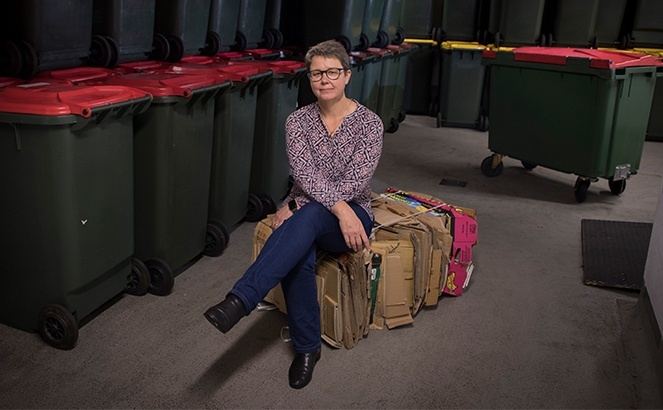 While Sharman has all the “dry data” at her fingertips to help Barangaroo South’s tenants continue their war on waste, making inroads into that mountain of rubbish Australians are accumulating each year demands more than facts and figures to drive change.